Rebel Session six captured Cape Towns big wave riders scoring a late season bonanza as the sexiest swell of the season hit one of Kommetjie's famed outer reefs on Saturday morning. The SE wind had howled all day on Friday and some of the forecasts predicted it would continue to blow on Saturday but as dawn broke there wasn’t a breath of air disturbing the mist shrouding Kommetjie's outer reefs. It wasn’t easy to tell through the mist if there where waves or not but the dedicated locals started the long paddle out in pre-dawn darkness and by the time the sun finally rose and the mist lifted 20 plus surfers looked around in amazement at the crowded lineup and perfect waves. In spite of the crowded conditions there was a festive vibe in the water with lots of banter as old friends chatted between sets and hooted each other into the cooking waves. The waves that did come through were absolutely classic, big, clean and with not a drop of water out of place. This was probably the last big wave session of the Capes winter and with the Rebels Sessions window closing on October 22 it may well have been the last opportunity for the surfers to put themselves in line to win a share of R110 000 prize money. There were more surfers than waves and more than a few of the guys did the long paddle out and back to the beach again without surfing a wave, while the usual suspects got all the good waves. It was obvious who had done their time in the water as the same guys were on the right spot for every set while the rest of the crew took it on the head. The standouts of the early session were the two young Kommetjie surfers, James Lowe and Matt Bromley. Matts distinctive lumo green board stood out as he consistently picked out the best waves of the morning. As the day progressed the line up started to empty out much to the delight of Ryan Payne and the Kommetjie locals Andy Marr, Simon Lowe and Mickey Duffus. These experienced surfers had been patient all morning and their strategy of paddling out later in the day paid dues when they ended up scoring some of the best waves of the day with just four guys out. Eventually the wind picked up and the tide got too high ending a very successful Rebel Session six. 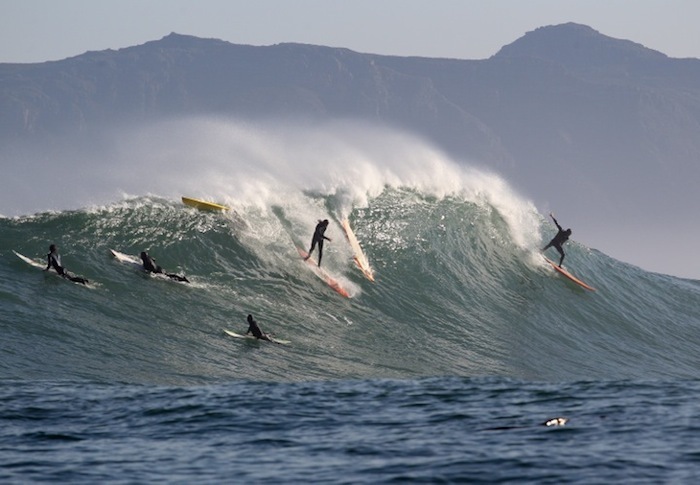 The Rebel Sessions seeks to recognize and reward the best surfers riding the giant waves off Cape Towns coast every winter with awards totaling R11000, 00 in prize money. The Rebel Sessions runs from 15th July till 22 October 2011. For more information visit rebelsessions.com.